What Is a Good Power Walking Pace on the Treadmill? Power walking shreds calories fast, whether on a treadmill or on the road. If you've taken up power walking to blast calories and ramp up your athletic prowess, kudos to you -- and it's wise to monitor your gait. Calorie burning is directly correlated to your walking speed, so setting your treadmill to the right pace can help you maximize your weight-control efforts. "Fitness" magazine recommends power walking at 4.5 mph to 5 mph, but you may need to work up to that speed. 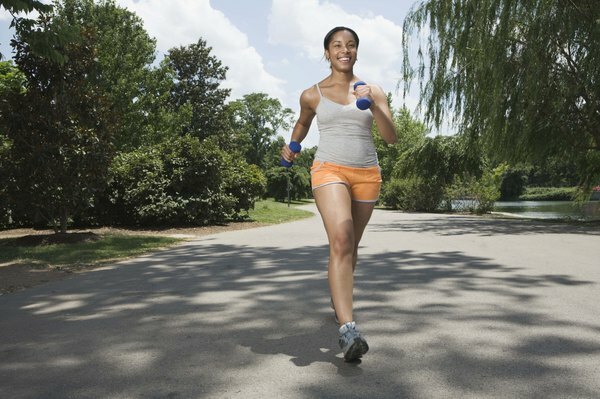 Pick up the walking pace and you could burn hundreds more calories per week. Walking at 3 mph, a moderate rate, a 150-pound woman burns about 240 calories per hour. At a moderately fast pace of 3.5 mph, she burns about 275 calories per hour. By bumping it up to 4.5 mph, the same woman burns roughly 310 calories per hour. That may not seem like much difference in a single workout, but the extra calories add up nicely over time. Numbers aside, the ideal treadmill pace for you is one that provides a moderate or vigorous cardio workout. If you're an exercise newbie, aim for a moderate speed; you should be able to hold a conversation, but not sing, as you walk. You'll breathe faster, but shouldn't feel out of breath; you'll also start to perspire lightly after about 10 minutes. 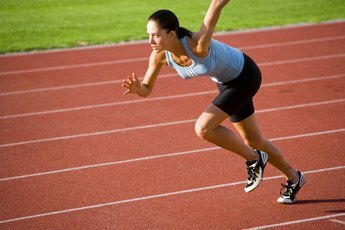 If you're already more fit, aim for vigorous speeds. You should only be able to speak a few words at a time, and should begin to perspire after several minutes. No matter what your speed, slow down if you feel breathless or dizzy. You may be eager to start power walking, but take the time to learn correct form -- your body will thank you. Point your toes straight ahead, keep your back straight and contract your abdominal muscles. Land on your heel as you step, then roll onto the ball of your foot and push off with your toes. Warm up and cool down with five minutes at an easy pace, and lean forward slightly when you speed up. The best way to walk quickly is with short, rapid steps rather than long, strained steps. 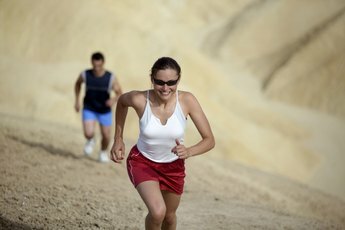 For optimal cardio health, perform 150 minutes per week of moderate cardio or 75 minutes per week of vigorous cardio. Break these sessions up as you please, but each workout should last at least 10 minutes. 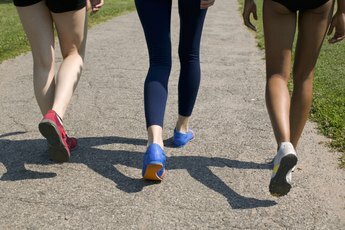 Walking can hurt your feet without the right footwear, so invest in a quality pair of walking shoes. Finally, check with your doctor before starting a workout routine. What Resistance Is Best to Lose Stomach Fat on a Treadmill? 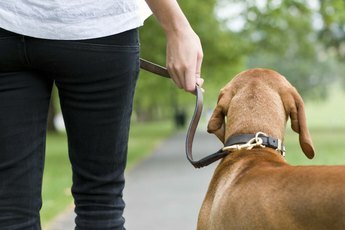 Does Your Metabolism Affect How Fast You Walk?